During World War II, the American OSS mounts covert operations against the Japanese army in the jungles of Burma. 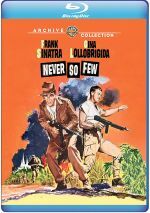 Including director John Sturges, a mix of Hollywood legends combine for 1959’s Never So Few. Set during World War II, Captain Tom Reynolds (Frank Sinatra) leads a team of Office of Strategic Services (OSS) operatives. Their work takes them to Burma, where they train locals to fight the Japanese. This leads to a mix of conflicts, especially when Chinese soldiers arrive on a mission to kill American soldiers. Historically, Few stands out in a few ways. It’s one of only two times Sturges and Sinatra worked together, and arguably more importantly, it introduced Sturges to Steve McQueen, a then largely unknown actor who would go on to fame via Sturges’s hits The Magnificent Seven and The Great Escape. If we ignore other efforts that involve the participants, does Few work on its own? Not especially. Never sure what focus it wants to take, the movie seems inconsistent and lackluster. Not that I demand all war films focus exclusively on combat, of course, but Few can’t decide where to go. It alternates between battle scenes and romance without clarity, and it fails to balance the two. Given Sturges’ success with “man’s movies”, his push toward the love story side of Few comes as a surprise, and that part of the movie fares least well. The romantic triangle it generates feels false, and we get little real chemistry between Sinatra and Gina Lollobrigada, the female lead. When Few shifts among its scenarios, it does so without much smoothness. This means it sends us from romance to combat in an awkward manner that doesn’t help move along the narrative well. It feels fun to see McQueen at an early stage in his career, and we also find Charles Bronson, James Hong and Dean Jones in pre-fame parts, but that curiosity value doesn’t become enough. Despite the talent involved, Never So Few winds up as a sluggish dud. Never So Few appears in an aspect ratio of approximately 2.35:1 on this Blu-ray Disc. The movie boasted a pretty solid transfer. For the most part, sharpness seemed fine. Softness affected some wider shots, though not on a consistent basis. The majority of the flick appeared crisp and concise. No issues with jagged edges or edge haloes materialized, and shimmering was absent. Source flaws were absent, so no specks or marks marred the presentation. Colors looked positive, as the movie featured an earthy palette that showed up nicely here. The various hues demonstrated nice clarity and vivacity at all times. Blacks showed good depth and darkness, while shadows portrayed clean and smooth imagery. Ultimately, this turned into a satisfying image. Never So Few offered a DTS-HD MA 5.1 soundtrack that worked well for its era. On the positive side, the music displayed fine stereo separation and breadth, and effects added some impact as well. Those elements could be a bit inconsistent, but they usually cropped up across the front well, and they threw in a little information from the rear. Toss in some directional dialogue and this was a good soundscape for its period. Audio quality came across nicely, with speech that tended to appear fairly natural. A little edginess occasionally impacted dialogue, but the lines largely came across well. Music seemed lush and full, while effects offered reasonable replication. Those elements lack great range and showed a little distortion, but they worked fine overall. This turned into a nice mix in general. The disc provides the movie’s trailer but it includes no other extras. An awkward combination of combat and romance, Never So Few disappoints. It doesn’t handle any of its sides well, so it leaves us with a mushy mess. The Blu-ray boasts very good picture and audio but it lacks bonus materials. Few becomes a bore.